Sprouts Farmers Market invited me to attend an event at the Colorado Beef Council. Little did I know it would turn into a wild, fast paced, steak-making challenge! 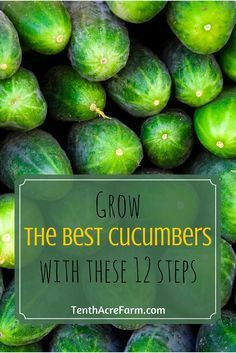 This is a sponsored event from Sprouts Farmers Market. So, it started out as a typical blogger event. 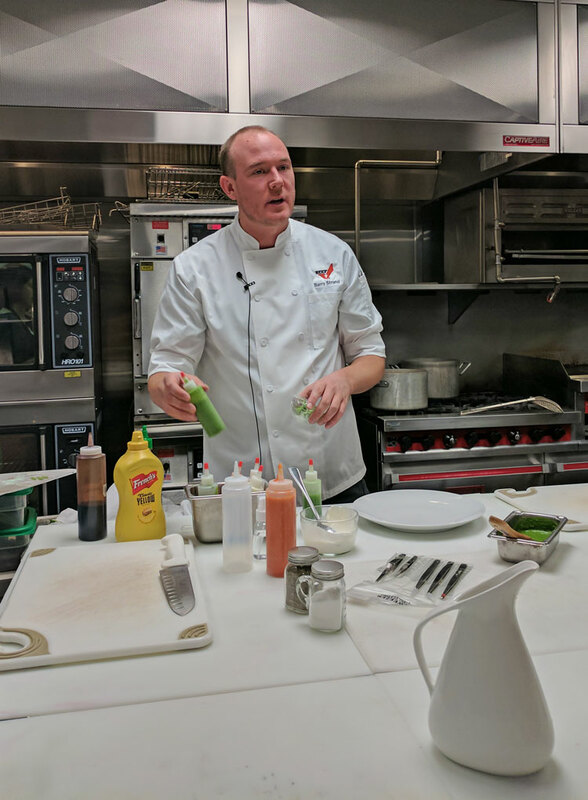 A bunch of local Denver bloggers gathered together to learn about a brand/product (Sprouts and the Colorado Beef Council). 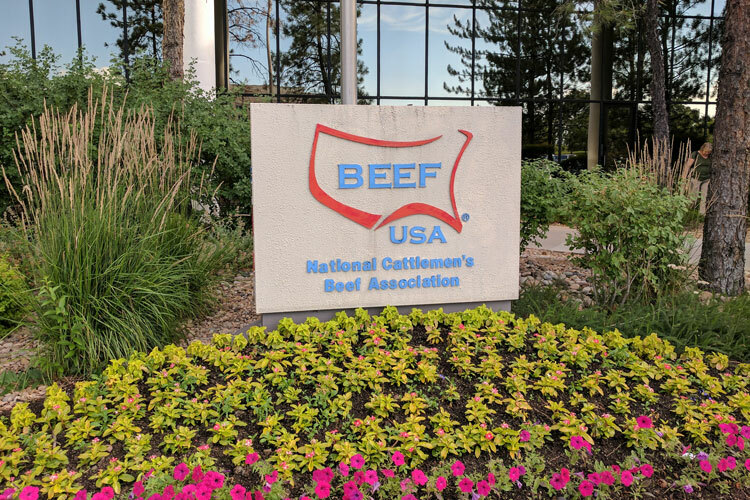 We sat in a formal conference room and listened to a few representatives talk about the Sprouts meat selection and about marketing efforts for the Colorado Ranchers. Sprouts carries both grass fed and natural beef that is pasture raised. 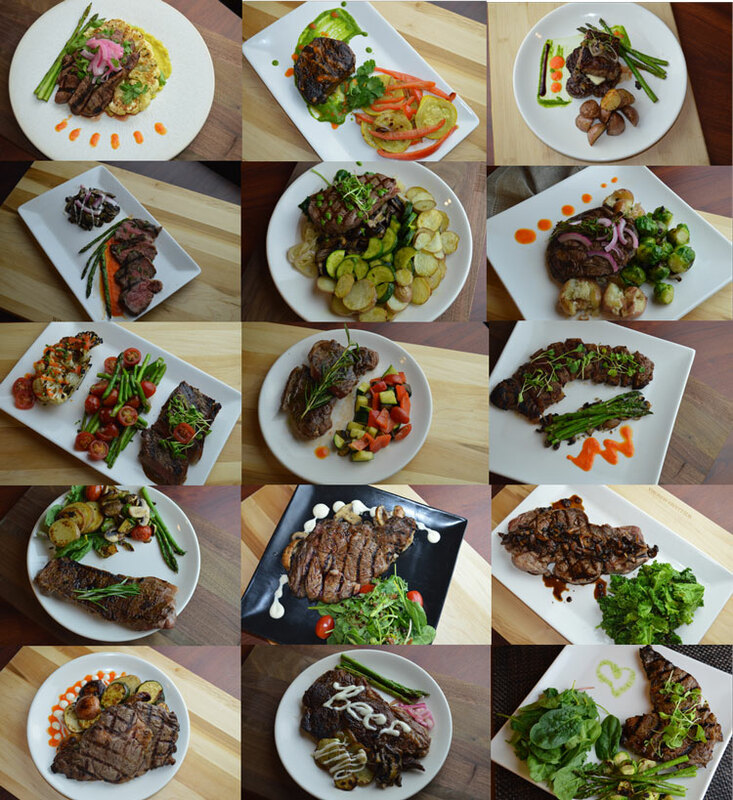 Get your choice of meat cuts – just how you like them. The butcher at Sprouts meat department will customize your meat order! Thin sliced? No problem. Whole chicken? No problem. 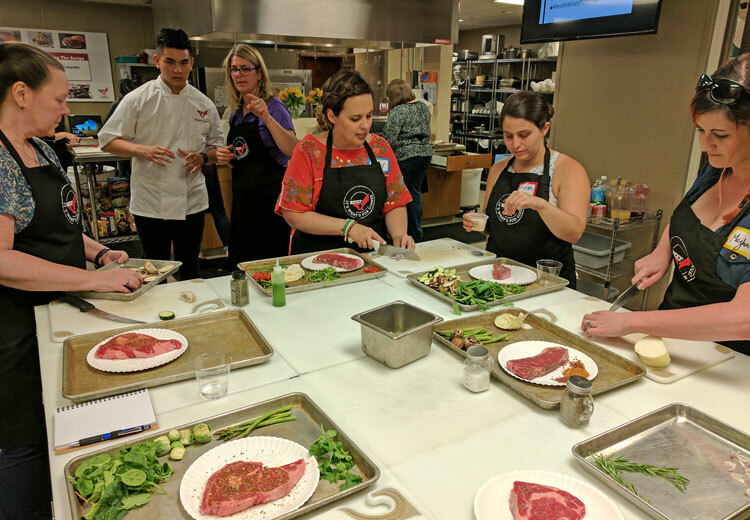 After introductions, we were all lead into the MASSIVE Colorado Beef Council kitchen. 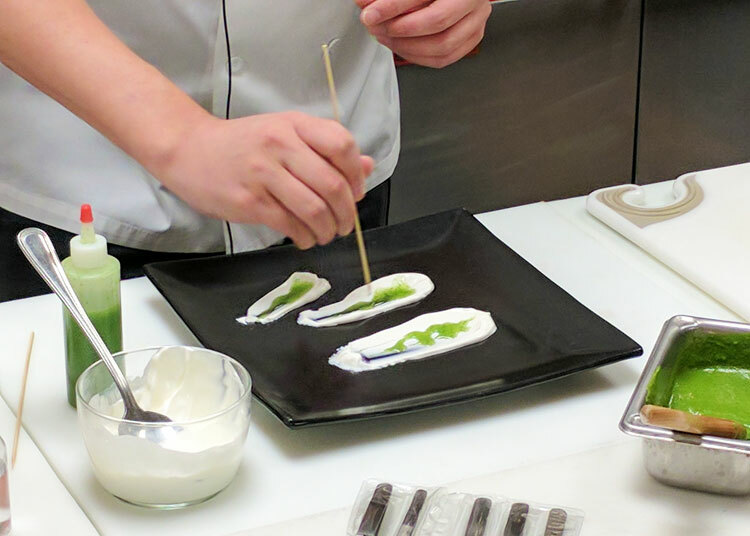 We learned a little about meal plating techniques and ways to utilize sauce to dress up the finished plate. 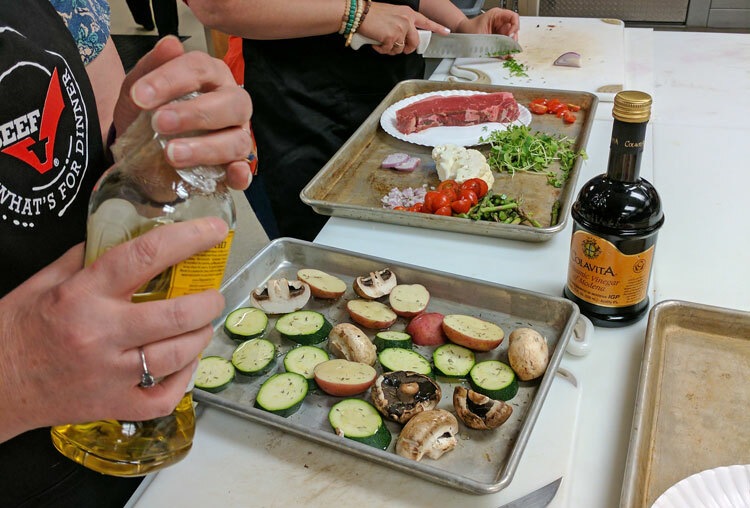 Then we were given a challenge to make a meal using (1) our choice of steak cut from Sprouts (2) side dishes using a table full of fresh ingredients. I headed to the ingredient table. It was full of spinach, kale, tomatoes, cauliflower, broccoli, squash, carrots, peppers, potatoes, asparagus, brussel sprouts, herbs, spices and sauces. It was a bit overwhelming! I didn’t know where to start! Finally, I listened to my stomach, which I always do… and settled on brussel sprouts and red potatoes. Since I had limited time to cook them, I opted to boil the vegetabels and then roast them on some tin foil on the grill while my steak was cooking. I added some oil, onions, rosemary and garlic to the potatoes. For the brussel sprouts I kept it simple with just olive oil and Himalayan sea salt. It was a hectic scene in the test kitchen! Bloggers running around with pots and pans and plates full of ingredients to make their special dishes. I had some down time while my side dishes were boiling – so I walked around and spied on everyone’s dishes. It was impressive to see what all the food bloggers were coming up with! 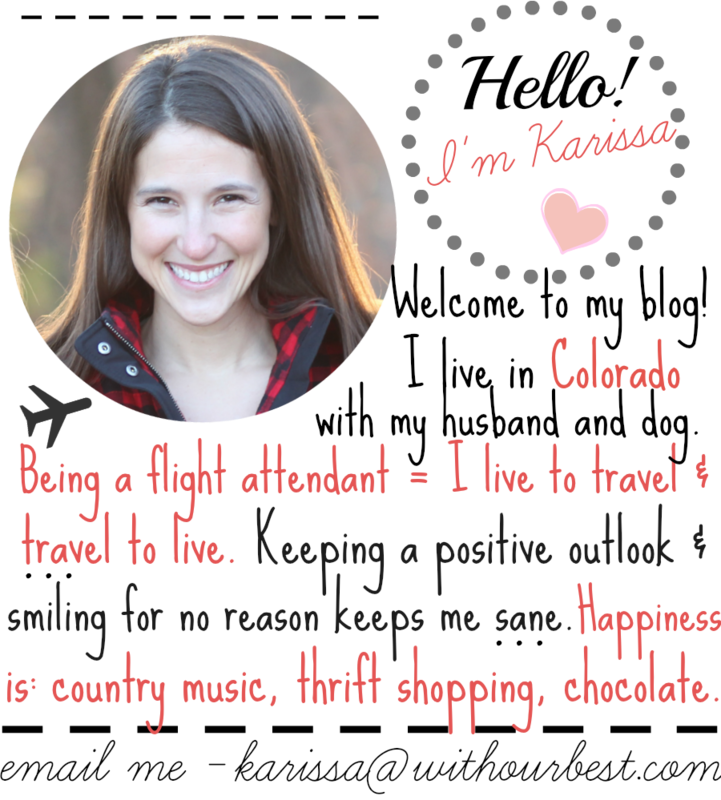 I must say there are some creative food bloggers in Denver! Here is my final dish! It was delicious and it turned out pretty lovely too! I am not usually a free-handed cook, but this experience surprised me! It was a lot easier when you have a million ingredients, seasonings and sauce the choose from – right in front of your nose! Also, dare I say it was my first time grilling a steak all by myself? Yes it was! Happy to admit the steak turned out tender and delicious! I might be addicted now that I know how to grill the right way! For best quality, defrost beef in the refrigerator, never at room temperature (on the counter). Use frozen beef within 6 months in the freezer to maintain quality. Salt beef after cooking. Salting before draws out moisture and restricts flavor. Some of the best cuts for grilling: Strip Steak, Flank Steak, and Ribeye Steak. 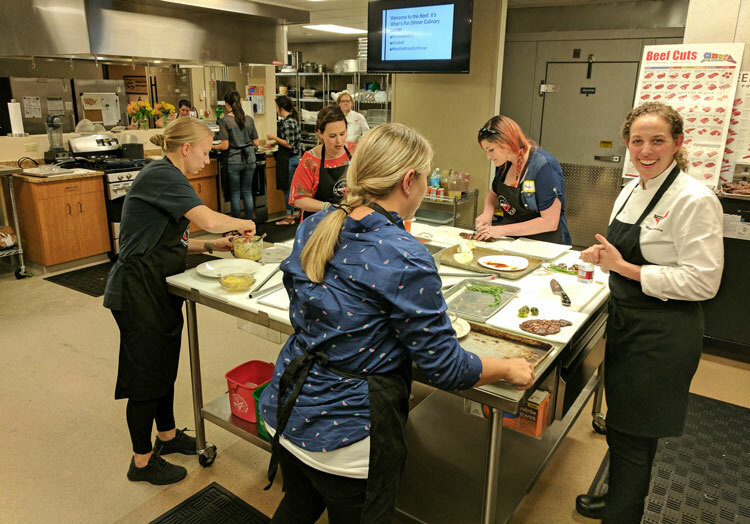 What a fun event with the Colorado Beef Council and Sprouts Farmers Market. The experience was a little wild, but a lot of fun! I’ve never cooked with that many chefs (food bloggers) in one kitchen before! Overall, the meal was delicious and I learned about how to cook a perfect steak! I don’t think I could ever grill a steak correctly. I always overcook my husband’s! Your steak looks delicious! Fun experience! 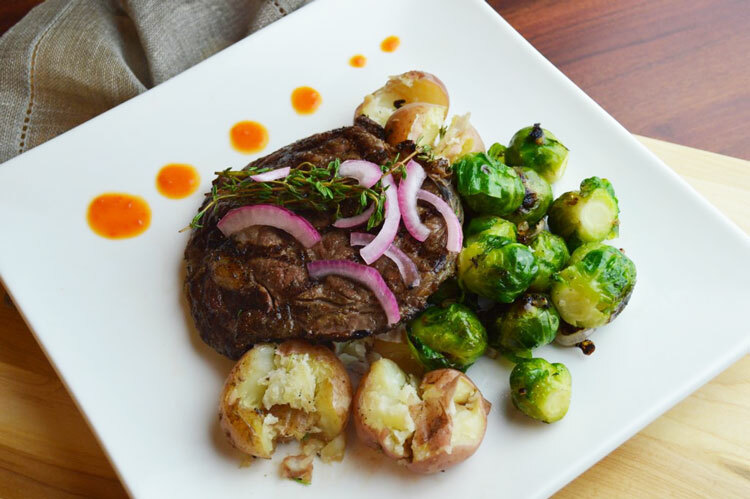 We get all of our meat and most of our seafood from Sprouts. Their grass fed ground beef is the absolute best I have ever had. Oh yum, this would be a lot of fun! I’m always trying to cook better. All the plates look amazing. WHAT FUN!! I am so glad they turned it into an exciting and involved event! I would have loved to have been there. Thanks for sharing the great images. Kind of feels like I was there. This looks like it was a fun experience! I remember the “Beef It’s What’s For Dinner” slogan but had no idea where it came from! This looks like so much food! And I don’t eat much red meat but this looks amazing!! What a fun experience. I’m not really good at grilling steak, so thank you for these great grilling tips. I’m sure that you had an amazing and fun experience! I love the food it looks fantastic and tempting.